Recently I have been experimenting with techniques for enhancing images of kids. With a little one in the house I have had lots of practice with baby and kid photos. I have noticed a few techniques tend to improve the quality of these pictures. The first technique I discovered is to get the camera down to their eye level. Babies and children are usually shorter and smaller than the photographer, yet most people simply aim the camera down and shoot from standing height. Bringing the camera down to the subject’s eye level creates more engaging photos. This is a technique described in an earlier blog post on portraiture, and it still holds true for subjects of any age. Photos of kids tend to come hand in hand with distracting backgrounds. It is very difficult to set up a pose with young children on a clean background. Most often I find myself grabbing shots when I can at playtime, at the park, or the playground. These areas are often littered with distracting background elements that diminish the impact of the photo. To help minimize the distraction of background elements I like to shoot with a low f-stop for a shallow depth of field. One caveat with this technique is it makes acquiring and maintaining proper focus more difficult. When shooting with low depth of field, even small movements can put the subject out of focus. To combat this I often shoot on continuous focus mode and take small bursts of photos rather than a single shot. 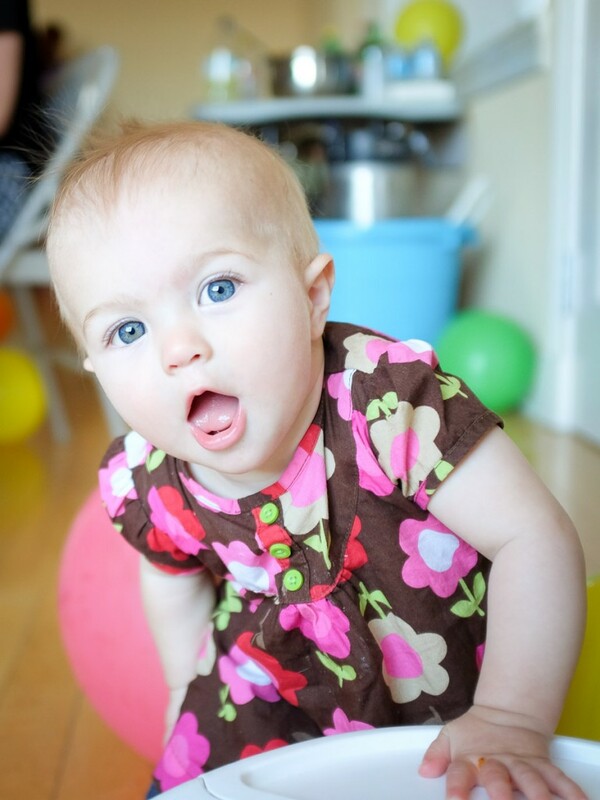 This usually means at least a few of the shots will be in sharp focus even if the child is moving around. 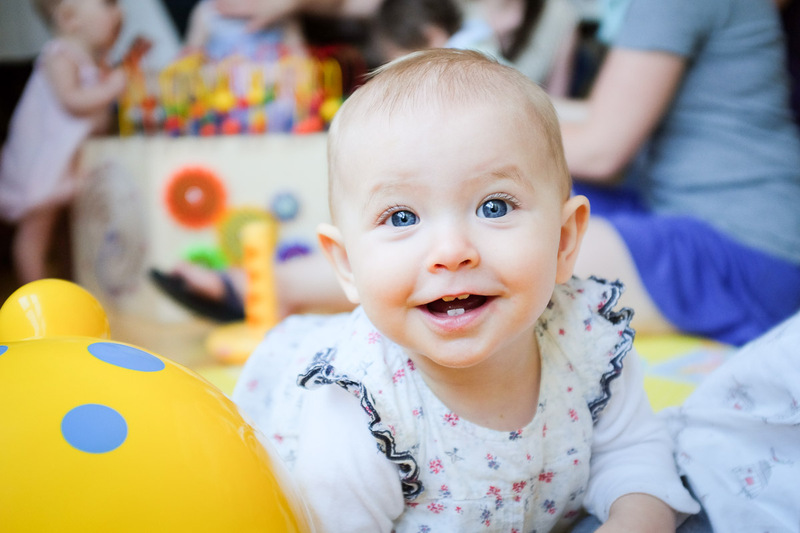 While editing photos I have noticed that pictures of kids often look best when they are brighter and overexposed. I think this has to do with brighter photos feeling more fun and playful as opposed to dark photos that feel more dramatic and moody. To create this look I like to set my camera’s meter to about +2/3 or +1 EV while shooting. If I forget to intentionally overexpose while shooting I can always raise the exposure later while editing on the computer. This technique is one I have just started to play with recently. After noticing that brighter more overexposed pictures of kids look better, I found a new technique that adds a little something extra. For this I combine two brush tool settings in Lightroom. First, I’ll add saturation and sharpness to the colored part of the eyes. Then, I’ll whiten the whites of the eyes. 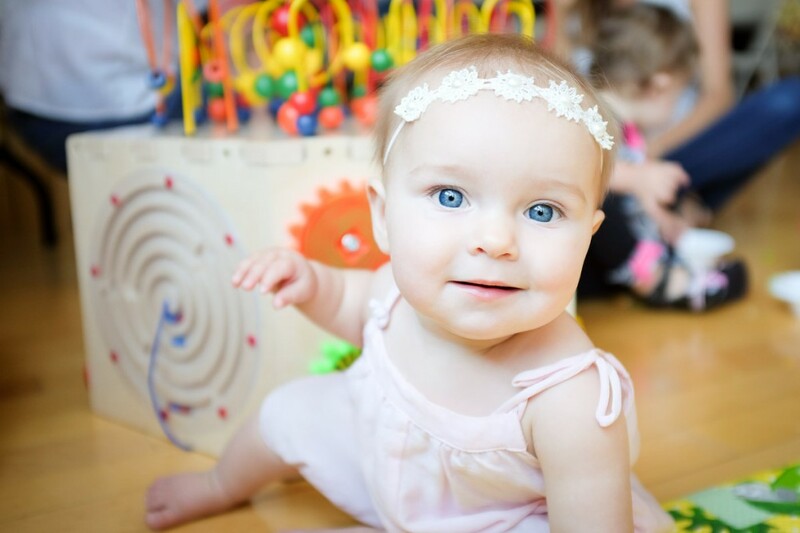 I find this combination really makes the eyes pop and creates a special look that works best on young children. 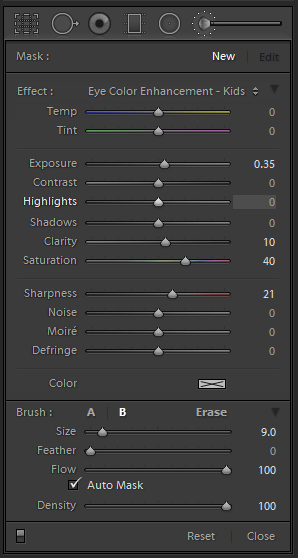 Here are the settings I have found work for me in Lightroom’s brush tool. Feel free to use them as a starting point and modify them as you experiment with the technique.